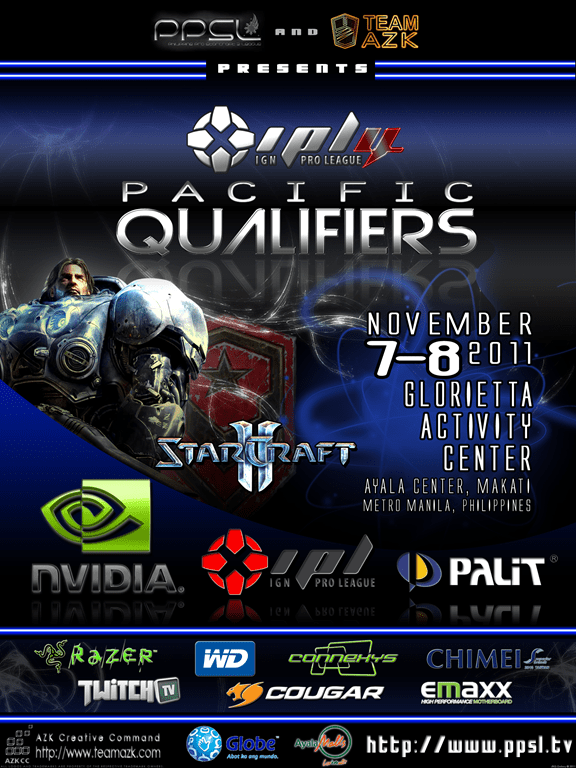 The much awaited IPL 4 Qualifiers for the South-East Asian (SEA) region will be hosted on November 7 to 8, 2011, by the Philippie Pro Starcraft II League Invitational at the Glorietta Activity Centre in Makati. Due to the newly found partnership with the IGN Pro League , a world class tournament with over $100,000 in prize pool and features the best players in the West, the Philippine Pro Starcraft II League has been announced as the official qualifying tournament for the IPL 4 in the SEA region. With foreign professional players like oGsMC, oGsInCa, WeMadeFox.Moon, WeMadeFox.Lynn, WeMadeFox.Soccer, and Thorzain participating, one can be sure that epic games will be played. Top players invited from the Philippines and across the world will be vying it out for $3,500 and an invitation to participate in the IPL 4 Live Event, you can be sure that everyone participating is going to be well practiced and ready to show what they are worth! Ill make sure to drop by Glorietta on one of those dates, even if its only in the evening XD Even though I havent played the game first hand, I am a fan of the Starcraft franchise and might be I’ll see how the new units are really used for live network battles. There is also the possibility of a few booths being there of course, some gaming equipment might just be on site.